Another of Victoria's major summer festivals is on its way. 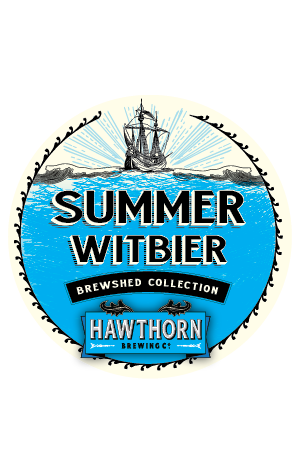 And, just as Ballarat Beer Festival was the occasion for Barrow Boys to launch their summer seasonal, so Hawthorn Brewing has chosen Geelong's Great Australian Beer Festival to debut its second Brewshed Collection beer. These are beers brewed as one-off, keg only releases, the first of which was last year's Red Rye Hand red ale. This time around they've gone for a witbier – Summer Witbier to be precise – that adds a little extra to the standard Belgian style ale. It's got the high percentage of wheat, a spot of rolled oats, old school noble hops and a traditional wheat beer yeast strain, plus Belgian bitter orange peel and some coriander seeds common to the style. But instead of stopping there they've added cardamom pods from India and lemon rind from Mornington Peninsula too. It's tapped at the festival for the first time on February 6, with drinkers told to expect "complex fruit and spice," low bitterness and "a dry and slightly tart finish".